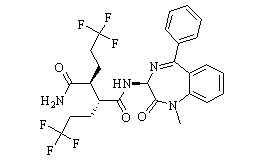 BMS-906024 is a novel, potent Notch receptor inhibitor . BMS-708163 is a γ-secretase inhibitor (GSI) (IC50 =0.3 nM). 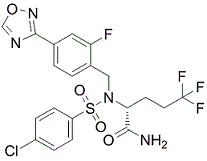 BMS-983970 is an oral pan-Notch inhibitor for the treatment of cancer. Semagacestat (LY450139) is a γ-secretase blocker with an IC50 of 15 nM. IMR-1A is the metabolite of IMR-1. IMR-1 is a novel class of Notch inhibitors targeting the transcriptional activation with IC50 of 6 μmol/L. YO-01027 interacts directly with theγ-secretase complex and targets the N-terminal Presenilin fragment. LY411575 is a potent γ-secretase inhibitor with IC50 of 0.078 nM/0.082 nM (membrane/cell-based), also inhibits Notch clevage with withIC50 of 0.39 nM. LY3039478 is a novel and potent Notch inhibitor. FLI-06 is a novel potent and selective small molecule intercepting Notch signaling and the early secretory pathway (EC50 ~2.3 μM), identified by using automated microscopy to monitor the trafficking and processing of a ligand-independent Notch-GFP fusion reporter.